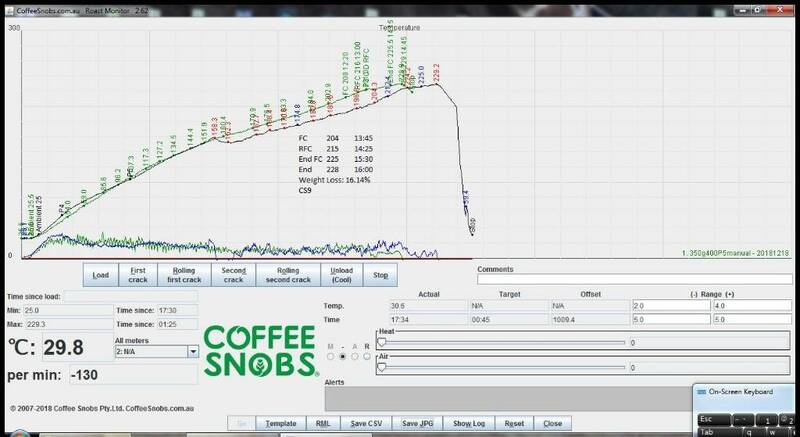 Im keen to try using a heatsnob to get better consistency and hoping ill learn more about roasting and what the beans are doing if install then probe into the bean mass. I know it's not the easiest mod to do to a Behmor (get probe into bean mass) but i have the people to help drill the spindle so makes it possible. 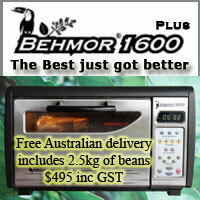 Question for roasting and Behmor knowledge trust, will i see a benefit of getting the probe in the bean mass or is it just a 'warm and fuzzy' to measure the bean temp vs air temp? If Bean temp measuring is really going over the top with no real benefit over air temp is the best place to position the probe on a behmor in the top left corner of behmor wall as per Andy's instructions? Happy to be directed to a post and this one deleted if i'm blind and cant see the info elsewhere. I think if you are going to measure temp , might as well measure the BT as it’s more meaningful. And it’s quite easy to do, I posted my wiper mod here if you do a search. Is it required? Not really, you can do yummy roasts in a simple way. But if you like to tinker and monitor stuff it’s great fun! are you still using the bead thermocouple or using at Stainless steel probe type now? Artman’s mid is in this thread in case helps other, post 24 onwards. Still using the bead probe. The insulation has melted a bit (not sure if that is from normal use or a minor chaff fire one time) but still works fine. The bead probe is cheap to replace regardless. If you are going to go to the trouble to monitor temps you might as well monitor bean temp. And the mod is fully reversible with no permanent damage (hole in spindle aside). The bead probe is cheap to replace regardless. You mean repairing the bead of the actual probe? The bead seems to be coping fine, its the insulation that is wearing. But even with that being worn it is still functioning well, tough little bugger! If they get a real pounding, one of the conductors will often break just behind the bead. Would take all of 5 minutes. cool, I didnt realise the bead is just a "simple" weld of the two wires. I only have a stick welder. Just had a quick google, small MAPP torches are quite cheap. Hey Martin did you end up doing the bean mass probe in your Behmor? I'm contemplating the same issue - have ordered a heatsnob for my new Behmor but then did some more reading and I'm questioning if the ET is worth it compared to BMT? I'm still learning the ropes, but keen to understand what's going on more each roast - I may be new, but I know about myself that I'm more of a precision-gear-and-always-pondering-the-what-if's kinda enthusiast. If you did it, or tried both, how did you find it? I would just measure the BT, it would be more meaningful than exhaust temp. Its easy and reversible. Thanks Artman. When I was saying ET I thought it meant Environmental Temp but it seems I was muddling my terms.. I was meaning bean mass probe vs drilling where Andy suggests in the HeatSnob thread to get an ambient temp of the air just above the drum. I guess I see the value of the bean mass temp, but it's more mucking around drilling/pilfering steel from my wiper blades/bending and experimenting for fit, etc - although I do really appreciate you sharing your method as a guide. I imagine it makes things slightly more fiddly to get the drum in and out as well? Do you find any position best for the probe? More smack bam in the centre or slightly off to the left? Hey jonjon, I've done the mod and it's great. I keep the probe/blade in the drum all the time, only need to unplug it if I want to take the drum elsewhere. Maybe initially fiddly but easy once you get used to the setup. But up to you which works for you. YEah as above, not really fiddly at all, I leave probe in the drum, just need to swivel it when opening the drum lid so it doesnt snag the mesh if it is orientated in the wrong spot. overall it is a smooth/easy operation. I guess it depends on your level of "mcgyvering" and telerance to tinkering. For me it was to measure something I was measuring on the corretto (BT) and i enjoy tinkering! the side probe inside air temp would be slightly easier to execute. re the dip, yes I see it, I didnt think of it as the probe being in a position to catch the cooler airflow, I think it is BT temp drop temporarily as the roaster has more volume of air with the same heat input = slight temp drop. I will have to have a look at all my profiles, but prety sure i always get a dip at 7m30s when the fan kick in, although from memory its worst when the roast load is hefty and/or if its bloody cold. 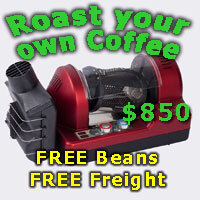 I also roast on manual so perhaps the one time the roaster used slightly different power at that moment? I know the BT bead probe is very sensitive at picking up temp, as is the roaster to ambient air. Eg on a cold night when i open the garage door during a roast the rush of cold air causes a dip in the BT temp. My probe is also well and truly bashed around now and the insulation has melted in a few spots, really must swap it over to a new bead one of these days - the old battered one is still going ok.
simonsk8r and jonjon like this. Ah right thanks for that, encouraging that it's normal haha. Yeh it was a fairly warmish day yesterday when I roasted, unless a gust of wind came at that exact moment for all my subsequent roasts which had that dip hehe. I think I understand what you mean about the volume of air etc. It's weird that it doesn't happen every time. And most roasts I'm roasting manually on P5 until later. But if it's really not an issue at all I'll just ignore it when it happens. I may to reconsider roasting on less windier days though, didn't realise it would have a dramatic effect seeing as though the roaster is fairly enclosed hehe. SO I took the plunge and modified my Behmor drum to install a BT probe. More details here. Good news is that it works!